Shipping and Receiving should always know what to expect from their packages and containers. Keep them posted with a selection of Class 7 DOT Shipping Labels to make sure that everyone knows what to look out for. 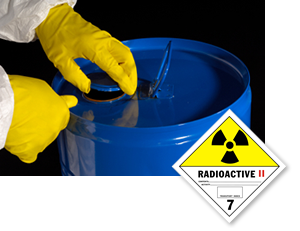 • Use for shipments which contain materials that may emit ionizing radiation. • Diamond-shaped placards with text and graphics. • Placards are also available without text for international comprehension, without a misunderstanding. Learn all about the IAEA's radiation exposure symbol and graphics.